The leaves are turning at the bases of the mountains, and it’s nice and chilly in the mornings when we wave goodbye to the boys on their way to school. September in Wyoming means hunting season, and although I’m technically not a hunter, I’ve managed to get out a handful of times now with Boone. 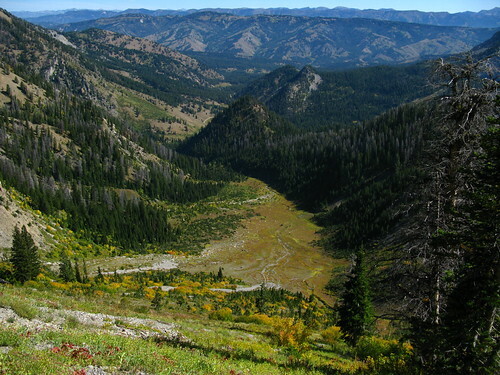 We’ve gone bow hunting up to his tree stand up above the Greys River a few times, and once down on the south end of the valley along the Emigrant Trail, both times looking for elk – but with no success. Rifle season began on the 15th of September up here, so Boone wanted to get an early start and see if our luck would change. Sunday night we packed up our overnight stuff and headed back into the Salt River range past Murphy Lakes to see what we could see. 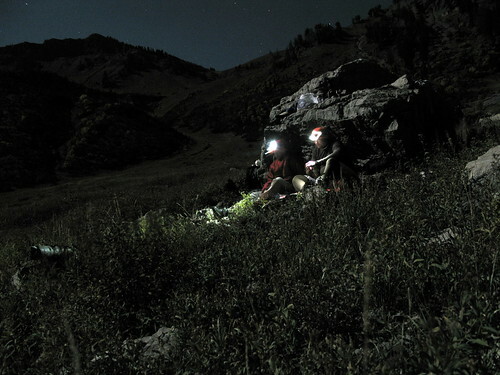 It ended up being quite a bit – by the time we started walking the full moon had crested the ridge and we were casting shadows and turning off headlamps. We had a general direction, and knew we wanted to get back into a small lake that we could see on our map. In the darkness, we thrashed our way across the side of the hill, trying to keep the sound of the creek below us within earshot. Presently, we came out of the thickness and crossed a small stream that led us into some small aspen, and then into a wide, slightly sloped meadow. There was no sign of the lake, so we figured it was just up a bit farther and around the corner. Making our way up the meadow, we sidled up to the biggest rock we could see and started to make camp. It was late enough that we were pretty hungry, so we quickly got our sleeping bags and bivy sacks out and got the water boiling for dinner. After a quick meal of dehydrated stroganoff (Boone) and vegetable lasagna (me) we called it a night and tucked ourselves in. The ground was pretty lumpy in spite of our best efforts to level things out, so you had to be quite flexible to get comfortable by wrapping yourself around rocks and roots and whatnot. I slept pretty good, and didn’t even wake up after Boone started puking a little after three in the morning. Dawn came soon enough, and we were up and getting sorted before the sun crested the far eastern horizon. That morning’s entertainment was watching the alpenglow on the walls of the bowl to the west of us change colors and postion while nibbling on breakfast. With the sun still on its way up over the near eastern ridge, we pulled out the binoculars and spent the next few hours trying to stay warm and looking for any sign of life around us. We did spot a couple of bucks up high to the west of us, but no shots were fired as Boone contemplated the process of going up and then bringing them down in his condition. So we waited a bit longer, and watched a couple of hunters below us set up a scope and start scanning the hillsides for deer as well. Eventually Boone felt well enough to shoulder the rifle and move around some, so we each grabbed an apple and split up. 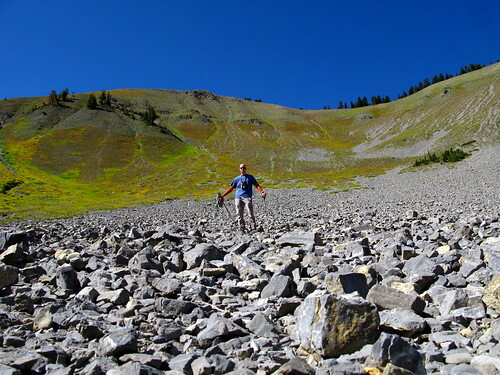 I headed north up towards the side of the bowl and then traversed back around, trying to make some noise and flush out anything that was bedded down still. 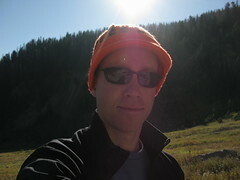 It being opening day of rifle season, I had my orange beanie on, and Boone promised not to shoot me. It was pretty steep stuff, but there was a lot of scrub and I had my trekking poles so it wasn’t too bad. I stayed pretty high, and didn’t hear anything, so just kept on moving. Over and around small ridges, I would pause every once in a while to peer back at Boone through the binocs and take a few pictures. The view back down the valley was pretty good and there were a lot of little interesting plants and shells(!) as I went along. I was up there a good couple of hours at least, and I guess I did flush out one buck that we’d seen that morning, but he took off the wrong way and Boone didn’t get a shot. 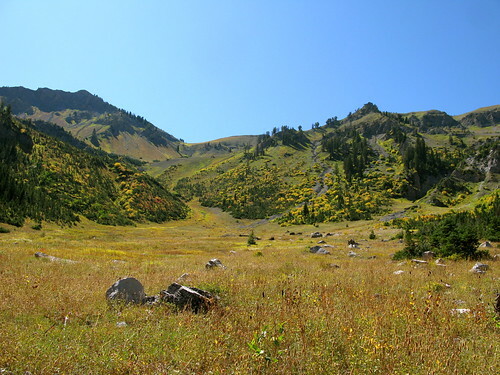 Eventually I made it up to the high bowl above our meadow, still a few hundred feet below the skyline ridge, but I only had half an apple left and wanted to meet up with Boone and get some water. I worked my way back down the ridge onto the high shoulder we couldn’t see from our camp. We ran into another hunter looking for a wounded buck he’d shot that morning – we had heard the shots – but the blood trail ran out and we were needing some water so we only stuck around to help look for a bit before heading back down. Boone was still feeling a bit under the weather, so we rested a bit under the shade of our rock before shouldering packs again and bee-lining it back to the stream to refill the water bottles. Boone had his handy-dandy UV light water purifier, so we traded back and forth a couple times until the batteries died, but both ended up with enough to get us back to the truck. We weren’t feeling too bad about the lack of deer – it would have been tough for us to get anything out of there with Boone’s stomach acting up, and we both had simply enjoyed being able to get into some new territory and explore a bit. The truck was still where we left it, so that was a plus as well. Packs went into the back and we hustled back to town to wrap it up. Not a bad way to kill a Monday, and not kill a deer.